August 26, 2013 - On Friday the U.S. Bankruptcy Court, District of Arizona granted conditional approval to Swift Air of its proposed second amended disclosure statement and authorized the company to immediately begin the process of soliciting creditor acceptances of its proposed plan of reorganization. The Bankruptcy Court has also scheduled a confirmation hearing with regard to the company's reorganization plan for September 30, 2013. In an important development, the Official Creditors' Committee in the company's Chapter 11 reorganization case indicated its full support and endorsement of the company's plan and strategies for emergence from bankruptcy, anticipated to occur by mid-October. Following Friday’s proceedings, Swift's CEO Jeff Conry said, "This is an important milestone in the company's continuing steps to emerge from chapter 11 in the very near future. We are gratified to have the support of our plan sponsor, Nimbos Holdings, as well as the Official Creditors' Committee. We will continue to work cooperatively with our key constituents to assure our plan is approved by the Court at the September 30th hearing, with a view toward emerging from bankruptcy protection in, or about, mid-October. Swift Air is a U.S. air career based in Phoenix, Arizona. It operates a fleet of business and commercial jets for charter and private use. Swift Air’s main hub is Phoenix Sky Harbor International Airport. The company provides chartered service on Boeing 737-400 aircraft for professional sports teams, dignitaries, political events, humanitarian missions, and sporting events. 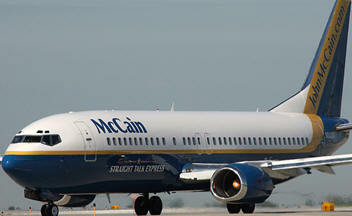 John McCain's 2008 presidential campaign utilized one of Swift Air's Boeing 737-400's, which was dubbed the "Straight Talk Express," the same name given to his bus used earlier in the campaign. In October 2009, Swift Aviation was under investigation by the FAA and OSHA for safety and maintenance issues. Employees reported they were told to lie to NTSB investigators over an incident of a nose-gear collapsing in 2008. On June 17, 2011, Swift Air voluntarily suspended their Part 121 operations pending an inquiry by the FAA. Swift Air resumed normal part 121 operations on June 25, 2011 after making manual changes to satisfy the FAA.